May this new year bring to you and your family warmth of love, and a light to guide your path towards a positive destination and gives you a peace filled life, warmth and togetherness in your family and much prosperity! 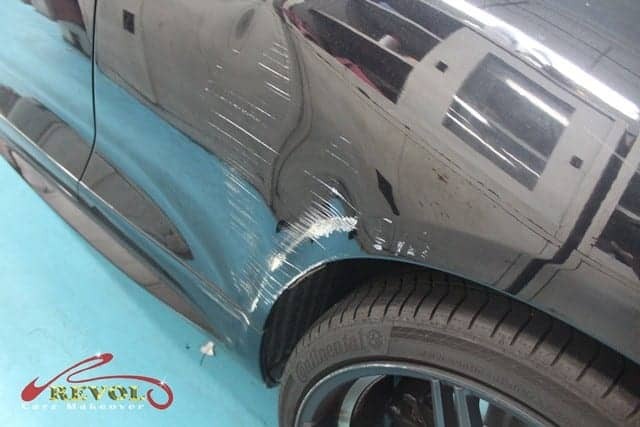 Nasty dents and deep scratches damage on the side of the sporty Volkswagen Scirocco drove the owner to decide on a full body repaint and protection with ZeTough Ceramic Paint Protection Coating at Revol Carz Makeover. Offered exclusively as the premium Scirocco R, the car features unique and sporty elements with typical R-model styling accents and performance. The Scirocco R can reach a hurricane speed of 257 km/h and 0-100km/h acceleration in 6 seconds. 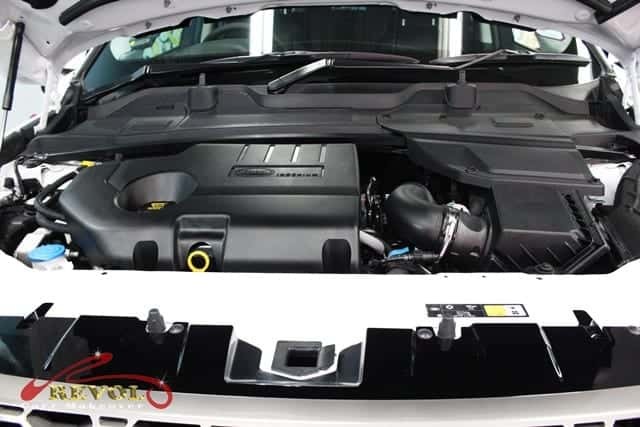 Under the hood lies a powerful 2.0-liter TSI Turbocharged engine producing 188kW of power and a maximum torque of 330Nm at 2,500 rpm. The impressive performance is delivered through a specially tuned sport chassis with adaptive chassis control, Extended Electronic Differential Lock (XDL) and 6-speed Direct Shift Gearbox (DSG). 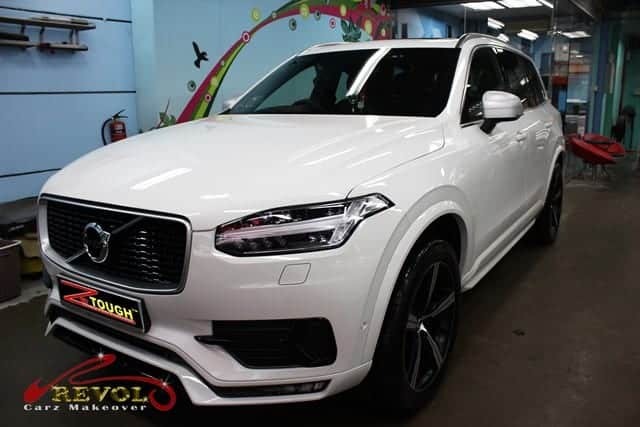 Inclusions are 19-inch Talladega Alloy Wheels, Bi-Xenon headlights, Bluetooth connectivity, parking distance sensors, RCD510 Audio System amongst an extensive equipment list that befits such extra-ordinary car. The proud owner had plenty to smile about on seeing his Scirocco R transformed into an incredible showroom condition after the Revol Makeover. We hope you will enjoy viewing the following transformation photos! 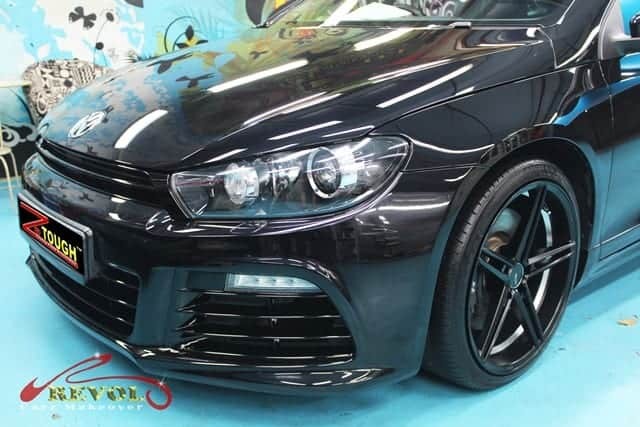 The Volkswagen Scirocco R arrived at Revol Carz Makeover for body repair followed by a full car respraying works with ultimate coating of ZeTough Ceramic Paint Protection. The original paintwork had seen better days. 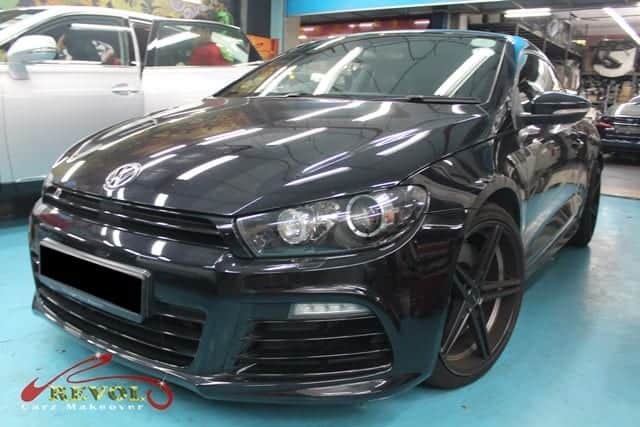 It breaks our hearts to see such nasty dents and scratches on a beautiful Scirocco R..
Our team at Revol Carz Makeover is exhilarated to present the complete transformation of the Volkswagen Scirocco R in its showroom glory. The front view features refined works with extreme gloss surface that has been coated with the long-lasting, ZeTough Ceramic Paint Protection. 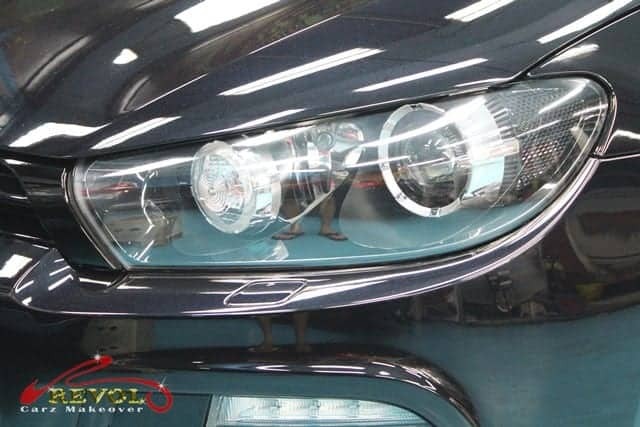 The polished crystal clear Bi-Xenon headlights look like brand new. 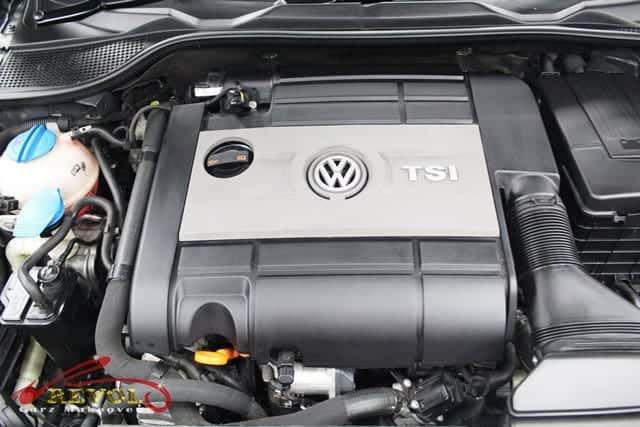 The powerful 2.0-liter TSI Turbocharged engine deserves intensive cleaning and polishing to achieve a brand-new look. The interior has been carefully cleaned, polished and sanitized. All leather surfaces are further treated and nourished. This was how the door-mirrors looked before the makeover. See the contrasting difference after the makeover? There is no secret that ZeTough Ceramic Paint Protection also makes the high gloss possible and permanent. 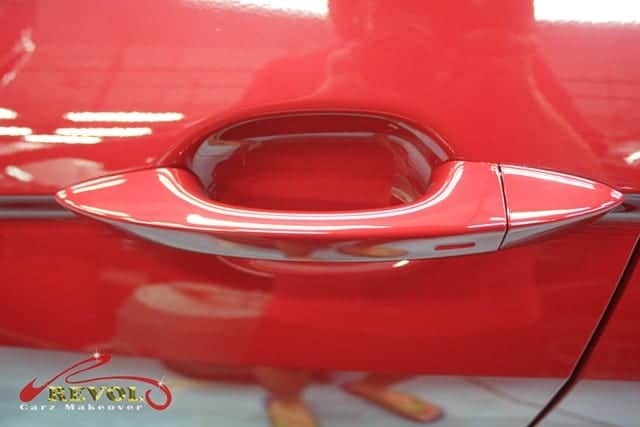 With ZeTough Ceramic Paint Protection coating, the eye-sore of finger nail scratches on the door handles are all things of the past. You can’t tell that there had been ugly dents and deep scratches on the rear left before. There is zero hint of ripple on the paintwork right after applying the ZeTough Paint Protection coating. The dull-looking exhaust tail pipe before polishing. The chromed exhaust tail pipe polished and looks new. 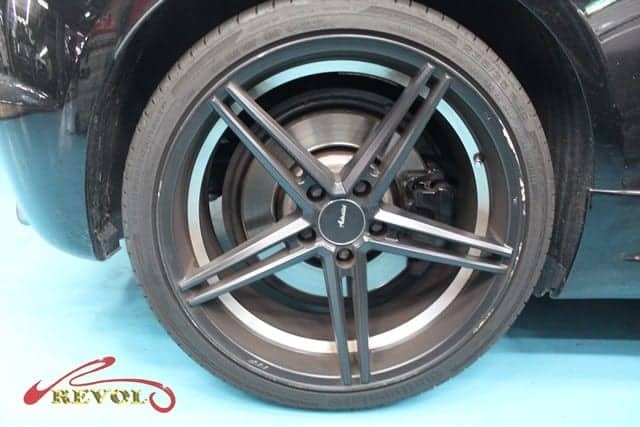 The 19-inch wheel covered with brake dust and kerb-scratched rashes. 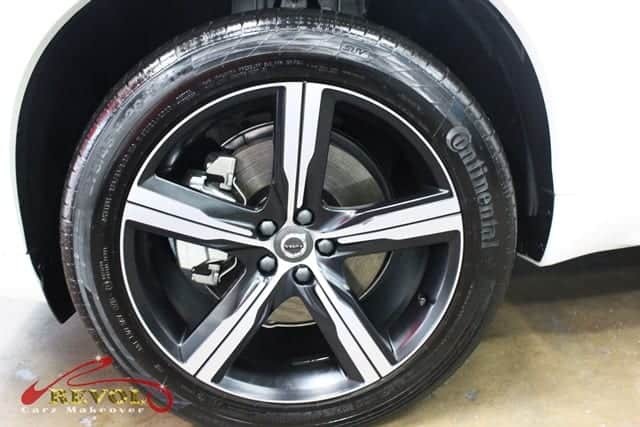 The super cleaned and polished Talladega alloy wheels are free of kerb-rashes and scratches. The holiday season is in the mist. And what a wonderful time it is for making brand new resolutions and exchanging of gifts to celebrate yet another good year. Perhaps you are considering a New Year resolution to reward yourself with a treat too in giving your prized car that deserving extraordinary makeover with long-lasting luster with ZeTough Ceramic Paint Protection Coating. With the treatment of the award winning ZeTough Ceramic Paint Protection Coating, we guarantee your car’s paintwork gets maximum protection with a brilliant showroom shine throughout your ownership. Maintenance after the treatment is minimal and easy. Our warmest greetings to all of you! In a blink, the end of the year is soon here when we all look forward to a lovely season of Christmas, a long-awaited holiday adventure or surprise your loved ones with that very special treat. For the new 2017 Land Rover Discovery Sport 2.0D, she deserves the indulgence of a unique treatment of the award-winning ZeTough Ceramic Paint Protection coating at Revol Carz Makeover to kick-start a new year for new journeys. The Discovery Sport 2.0D SE is the most agile, responsive and dynamic Land Rover ever built. Its light-weight aluminum monocoque body with suite of intuitive technologies delivers a comfortable and dynamic performance with speed and agility. The seven-seater SUV’s latest Terrain Response System is capable of adapting to changing road and weather condition seamlessly. A 240 horsepower, JLR’s 2.0-liter diesel, turbo four-cylinder engine with a nine-speed automatic, and standard all-wheel drive promise efficient all-weather prowess. We hope you will enjoy viewing the following photos! Be dazzled by Revol’s dramatic makeover of the new Land Rover Discovery Sport 2.0D SE with the award-winning ZeTough Ceramic Paint Protection Coating. The task requires dexterity in bringing the headlamps to such exemplary level. The task of detailing the interior down to the nitty-gritty is a satisfying challenge for our professional detailers. The dust-free and polished dial cluster pumps up the adrenaline for the driver. The detailed door opens to welcome you to a pleasant adventure, big or small. A close-up shot of the door mirror shows how ZeTough Ceramic Paint Protection coating exceeds the original condition of the surface of the car’s finish. 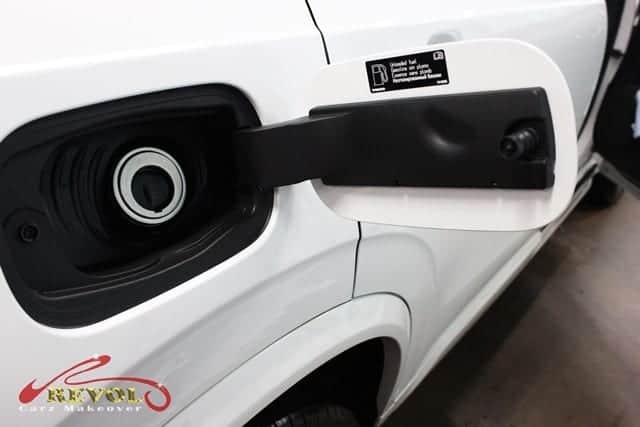 The “Gesture” feature allows you to open and close the tailgate from outside the vehicle with a kicking gesture under the rear bumper without needing to physically touch the vehicle or use the smart key. The passionately polished tail-lights certainly bring out a classy appeal. 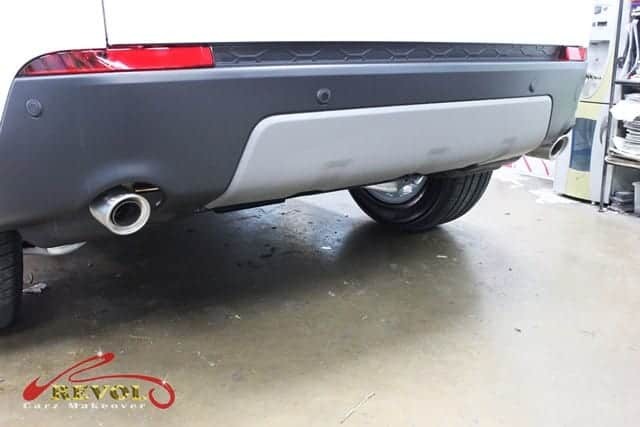 We never overlook to restore the exhaust tail-pipes to like-new condition. 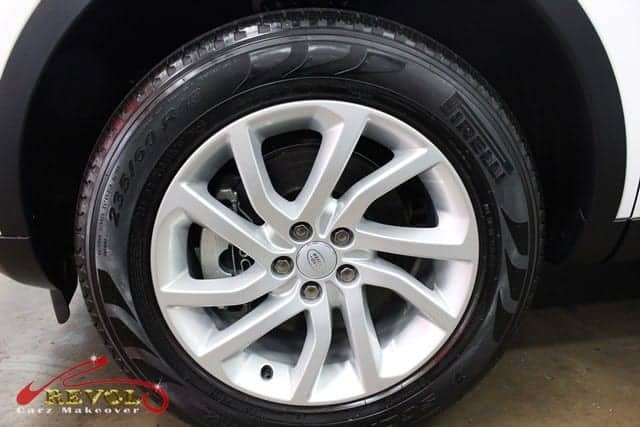 We remove all the alloy wheels for careful cleaning and polishing. All scratches and kerb-rashes are restored like brand new again. It’s a season of adventure again…a season to give your beloved car that special treatment of ZeTough Ceramic Paint Protection coating! If you are impressed by the transformation of the Land Rover Discovery, we can transform your car to such a breathtaking showroom condition too. Revol Carz Makeover is your right choice. Visit us to know more about our affordable and transparent services. 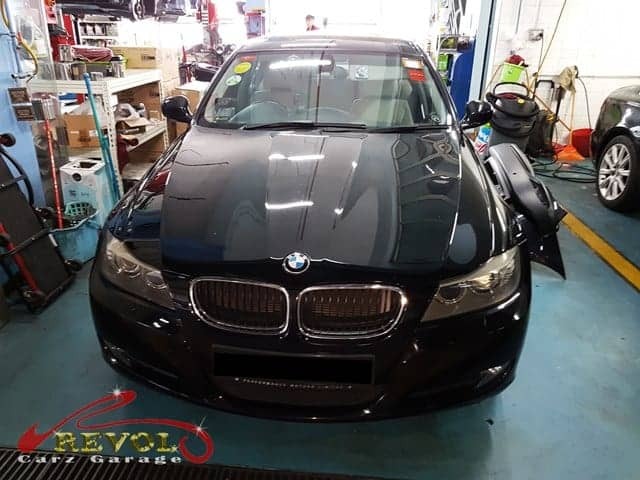 With the proven coating of the Eco-friendly ZeTough Ceramic Paint Protection coating, we guarantee your car’s paintwork gets unparalleled protection with the guaranteed showroom shine throughout your ownership. Maintenance after the coating is minimal. Is your Mercedes Benz taking longer time to start the engine during cranking? As it may seem normal for some, it is actually a wear and tear issue needed to be rectify before major repair kicked in. 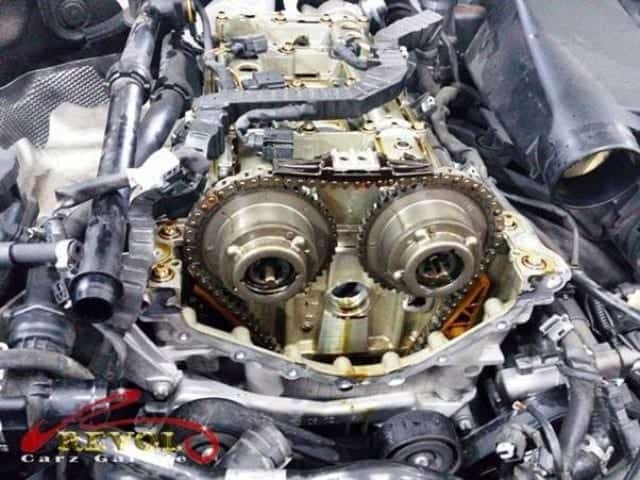 Today we have one of our customer who is facing such issue and we are glad to be able to perform the assistance to resolve his issue and our professional technician professionally diagnosed the worn out timing gear sprocket. 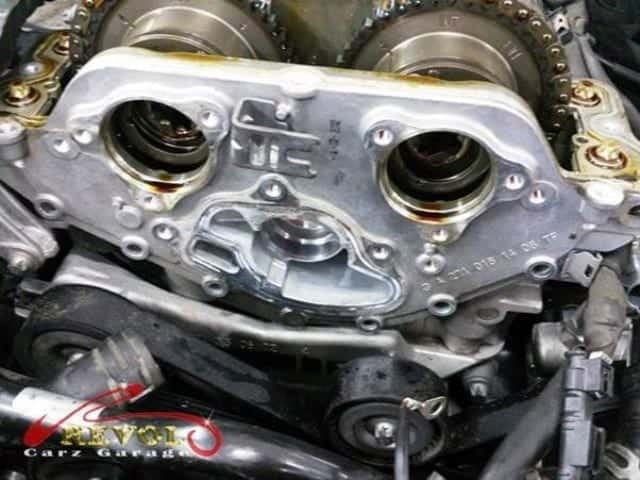 Professional expertise is important and not forgetting getting a workshop who thinks on your best interest will be able to prevent you from replacing unnecessary parts. We hope you will enjoy viewing the following photos. Are you able to identify which is the timing gear sprocket? The new 2017 Volkswagen Tiguan 1.4TSI Highline receives a prestigious welcome at Revol Carz Makeover for a professional grooming with ZeTough Ceramic Paint Protection Coating treatment. Our impression of the Tiguan Highline was indeed, jaw-dropping. The huge expressive exterior and spacious interior with many sophisticated features were quite unusual for a 1.4TSI hatchback. The VW Tiguan 1.4 TSI Highline receives a turbocharged direct injection petrol 4-cylinder engine. With its DSG 6-Speed wet-clutch direct shift gearbox, you can achieve the 0- 100km/h acceleration in 8.9 seconds and a top speed of 200km/h. Standard features include Active Info Display (AID), daytime running lights (DRL), powered leather seats, 8-inch touch screen display with navigation, and 18-inch alloy wheels. 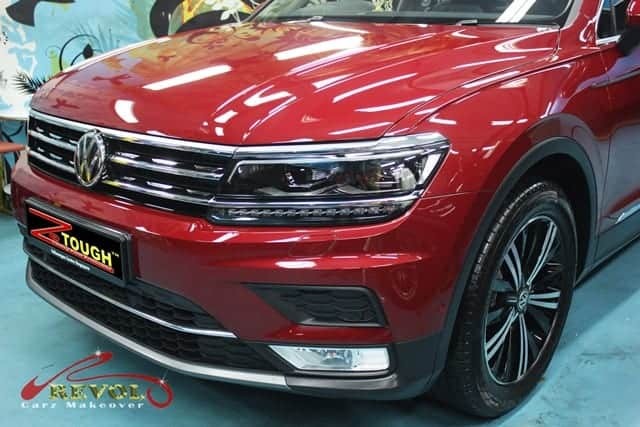 We proudly present the 2017 VOLKSWAGEN TIGUAN HIGHLINE TSI after the treatment of ZeTough Ceramic Paint Protection Coating. 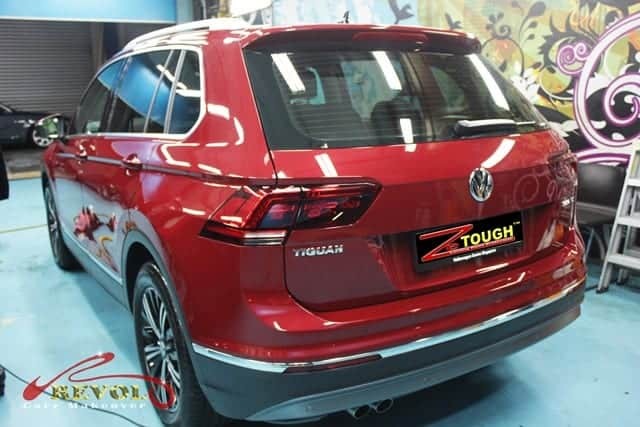 The 2017 Tiguan Highline gets more intense and long lasting gleam with the ZeTough Ceramic Paint Protection coating. The Active Bonnet reduces the risk of injury to pedestrians by lifting upward in the event of an impact – rising 50mm in a flash of 22 milliseconds of an impact. 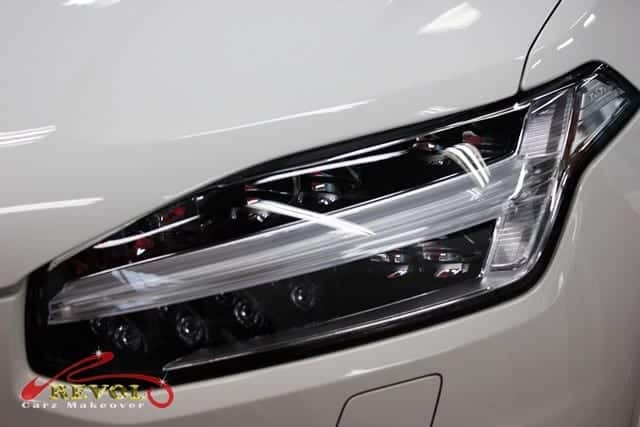 The Adaptive LED headlights and daytime running lights are clear as crystal after ZeTough headlamp coating. The car can sense the ambient brightness and switches on the LED headlights automatically. Compliments from the impressed car owner were motivating for our professional detailing. 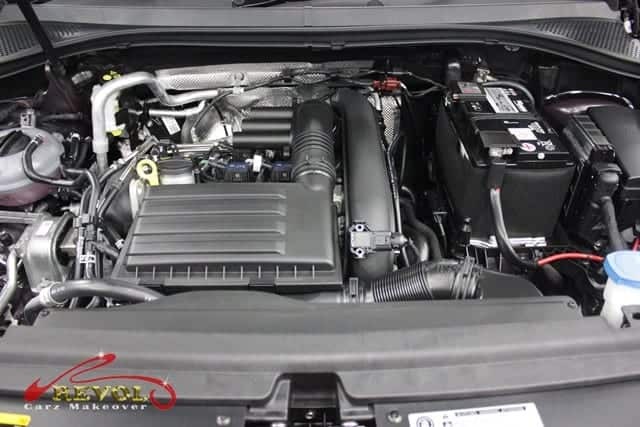 We made sure the engine is spick and span in the professional detailing. 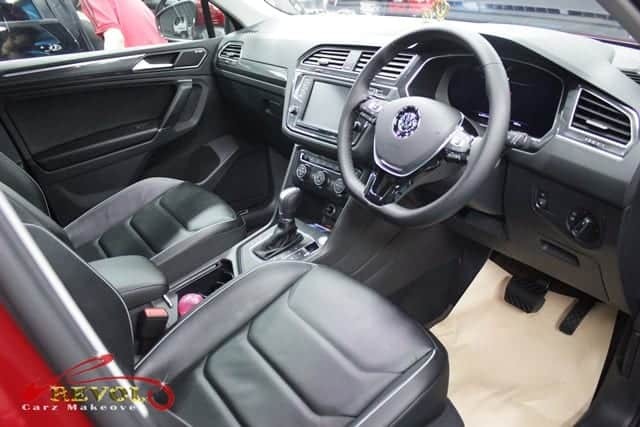 The VW Tiguan’s luxurious interior that has been passionately detailed, cleaned, polished and sanitized to give an even more lasting and spectacular appearance than ever. The soft leather on console and leather seats are nourished and treated with eco-friendly protection. 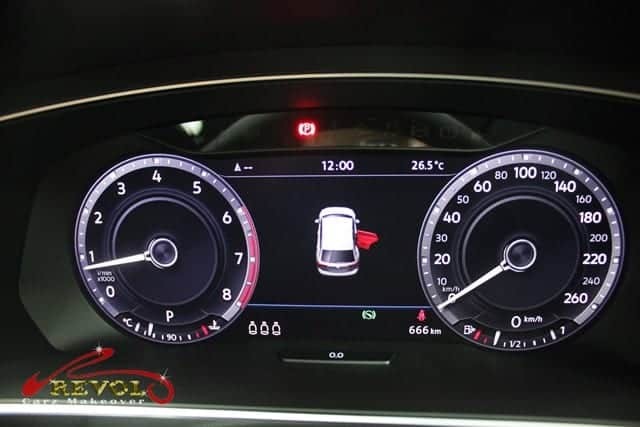 A crystal clear digital instrument cluster is a joy for the driver behind the wheel. 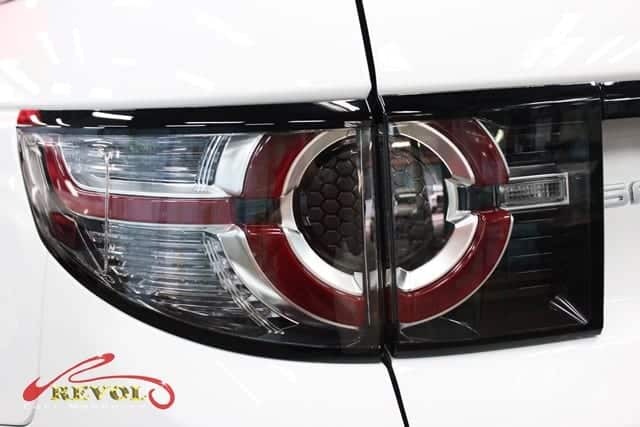 Close up view of the electrical wing mirror brags of a long-lasting, diamond-hard and shiny surface after professional polishing and coated with ZeTough Ceramic Paint Protection. With the hard protective surface coating of ZeTough Ceramic Paint Protection, common headaches such as accidental ugly finger-nails and ring scratches are things of the past. 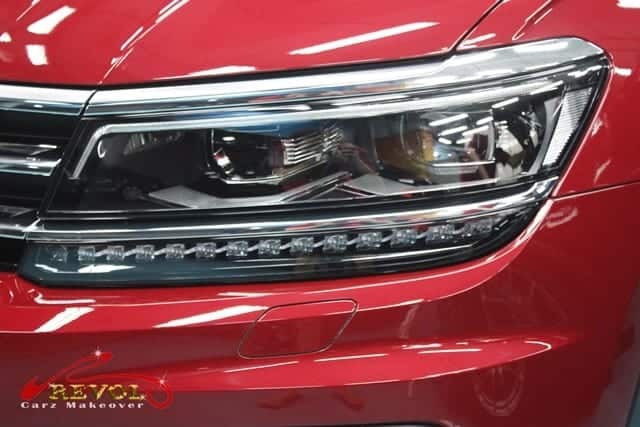 The Tiguan Highline freezes your gaze after the Revol makeover. The gleaming rear end receives as much attention as the front after the coating of ZeTough Ceramic Paint Protection is fully cured. The electric tail-gate can easily open from the driving seat or with the remote control key. It closes automatically at the press of a button located on the boot lid. 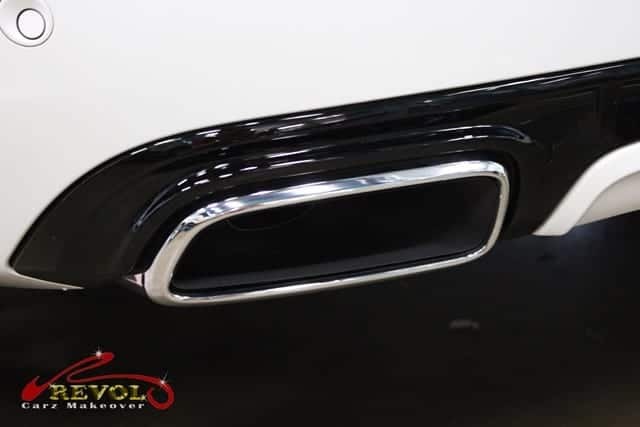 At Revol Carz Makeover, our professional detailing leave no stone unturned. 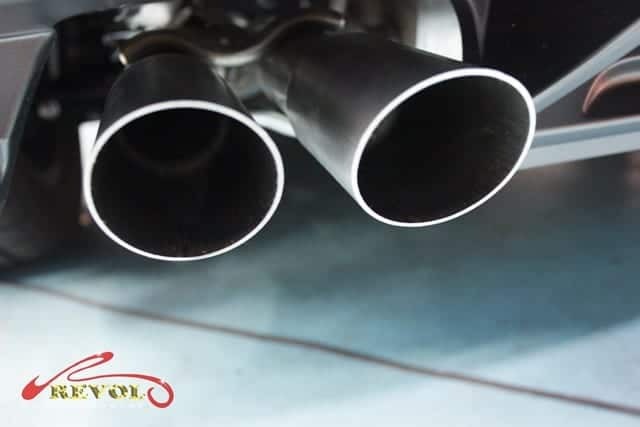 We consistently cleaned and polished the exhaust tail pipes to look like brand new again. 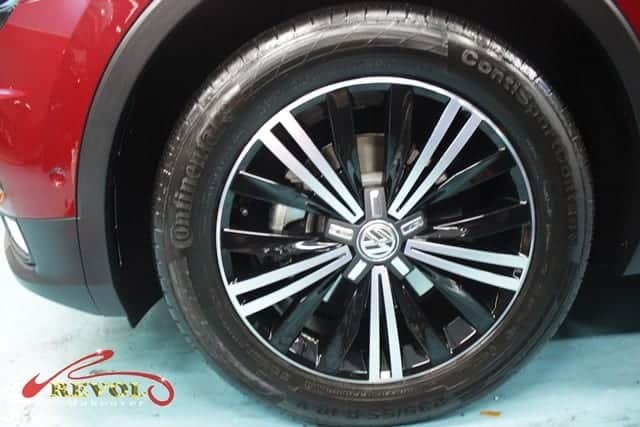 Volkswagen Highline receives 18-inch alloy wheels with 235/55 R18 tires as standard. 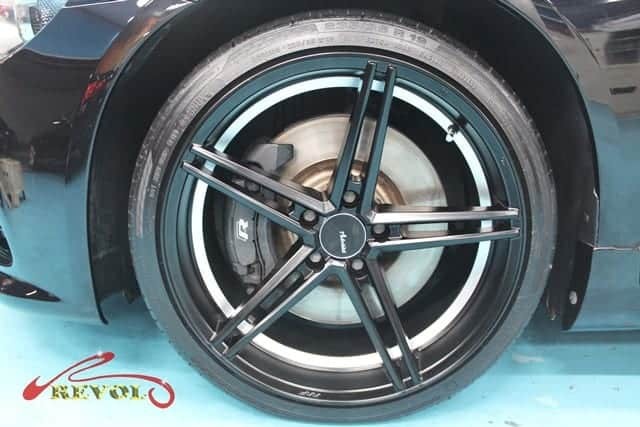 The wheels and wheel arches are cleaned and polished and any kerb rash on the wheels is repaired at Revol Carz Makeover. Received the keys to your brand new car recently? Did you know that car importers usually give their new vehicles just a coat or two of wax before delivering the car to you? 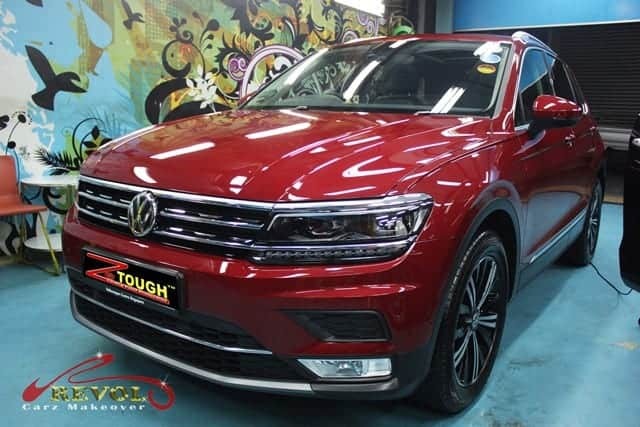 Like the owner of the Volkswagen Tiguan Highline, he wasted no time to send it for reliable, a long-lasting paint protection. Whether your car is new or not-so-new, giving it a makeover and paint protection coating easily extends the car’s lifespan. 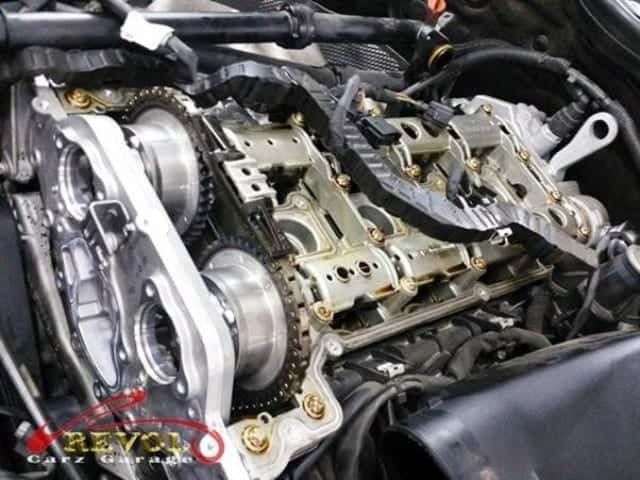 At Revol Carz Garage, our “Customers first” business philosophy aims to provide every customer with the best interest and priority. 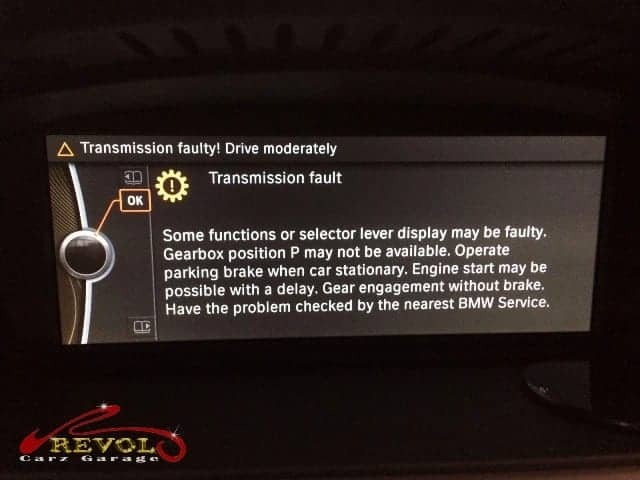 A customer was resigned to having his automatic transmission replaced when his car was unable to engage the gears. Fortunately, our experienced technician promptly diagnosed the issue with precision thus saving the customer considerable repair cost. He would have been persuaded to replace the whole mechatronic had he sought to repair at other Auto workshops. We only replaced the sensor to get the gearbox working perfectly again at only a small fraction of the cost. It is always prudent to seek a second opinion especially with major car repair issues. Revol Carz Garage sets itself apart with dedication to customer interest and care. We hope you enjoy viewing the following photos. 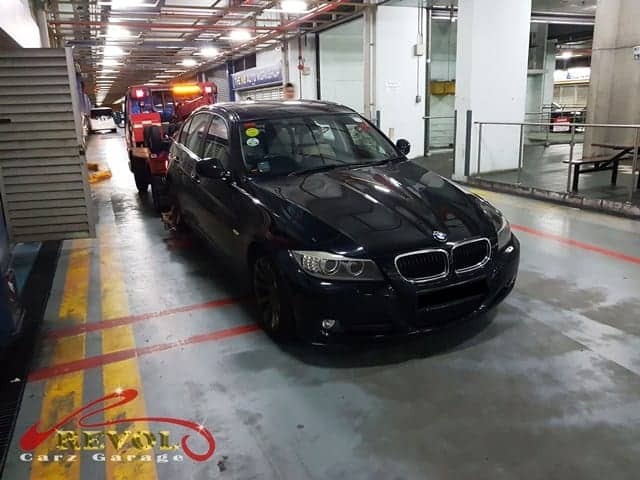 The BMW had to be towed to our workshop as its automatic gears were failed to engage. The transmission fault code is displayed. Replacement of the auto transmission sensor includes replacing the auto transmission fluid and filter. Resolving the gearbox issue promptly within the same day is as exhilarating for us as for the customer. If you have any issue with your gearbox or any part of your car, do feel free to contact us. We will always serve you with the best of your interest! The 2017 model Volvo XC90 T6 luxury midsize SUV deserves the finest paint protection coating in the market. 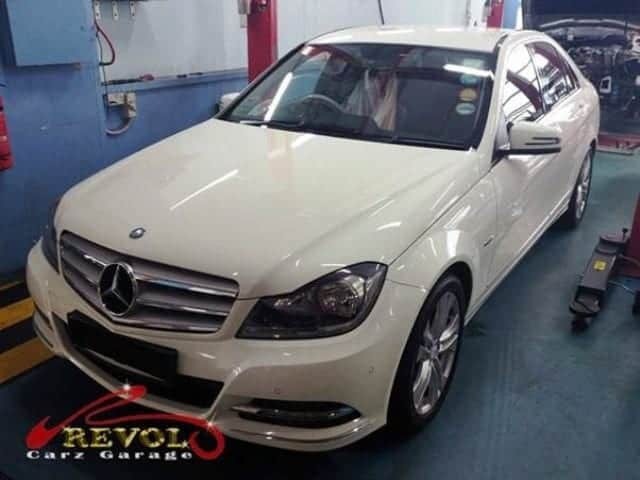 Revol Carz Makeover is privileged to render the premium grooming service with the award-winning ZeTough Ceramic Paint Protection Coating that guarantees a long-term protection and showroom shine. The XC90 exudes power with the upright grille and the strong shoulders, both of which are classic Volvo style cues. The handsome square-jawed ultra-deluxe Volvo XC90 offers more efficiency and safety features than its rivals. 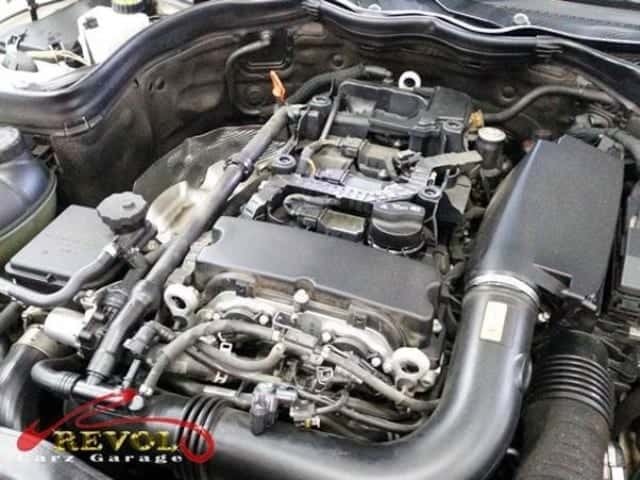 The 2.0-liter 4-cylinder turbocharged supercharged 1969 cc petrol engine creates 316 horsepower and drives all 4-wheels through an 8-speed automatic transmission. 0-100km/h acceleration clocks at 6.5 seconds while the top speed hits 230 km/h. The elegantly appointed cabin is lavish with luxurious materials and superb craftsmanship and seats seven adults comfortably. We are proud to present the 2017 VOLVO XC90 T6 R-design in a spectacular showroom condition after ZeTough Ceramic Paint Protection Coating. The XC90 exudes power with the upright grille and the strong shoulders. The dazzling new-look is enhanced with the powerful coating of ZeTough Ceramic Paint Protection. The sanitized 2.0-liter 4-cylinder turbocharged supercharged engine comes to life after the makeover. When it comes to detailing the lavish interior, we are driven by passion to ensure every inch is perfectly clean and polished. The fine Nappa leathers are richly nourished with premium leather-care products. It’s a joy to drive the XC90 with clean and clear instrument cluster. We pull a close-up shot of the electric door-mirror to show our quality works. 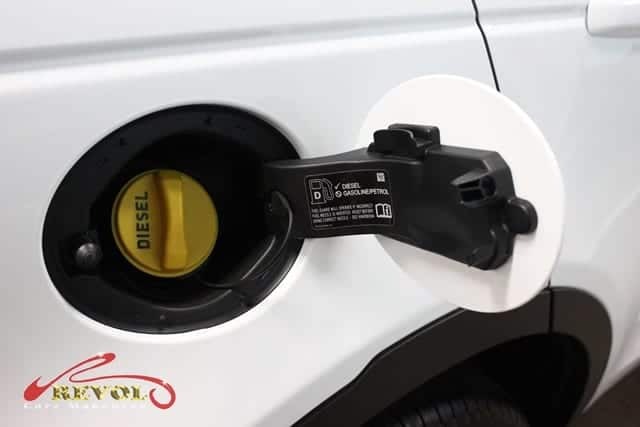 We ensure the fuel tank “door” and surrounding is never overlooked. Fuel consumption is 12.5 km/liter. With a touch of the ZeTough Ceramic Paint Protection coating, the rear view of the XC90 looks even more stunning. The exhaust tail-pipes look like new after enthusiastic polishing. The wheels have been consistently restored cleaned and polished to look like always brand new.